Design your own stranded colourwork using FINGERLESS MITTS as an experimental canvas. Develop patterns and shading that celebrate knitting sheaths held in the Shetland Museum and Archives, or the Shetland Croft House Museum in Dunrossness. Create with a specially curated palette of Jamieson & Smith 2 ply Jumper Weight Yarn. Pattern by: Felicity Ford. WHAT IS A MITTS-A-LONG? Like a KAL (knit-a-long), a mitts-a-long is about knitting together, using the Internet to keep track of one another’s progress. Mitts are treated as a blank canvas on which to explore ideas discovered through applying the KNITSONIK System to a shared inspiration source; comrades develop patterns and shading schemes, helping and encouraging each other on the way. This mitts-a-long coincides with Shetland Wool Week 2016 and features two possible options; both have been devised as a creative celebration of Shetland’s rich cultural history, to be worked on and enjoyed with glorious Shetland wool! SUPPORT DURING THE MITTS-A-LONG The mitts-a-long officially begins 24th September 2016 and ends 24th October 2016, but you can join at any time. The start date coincides with the launch of Shetland Wool Week. INSPIRATION SOURCE FOR THE KNITTING SHEATH MITTS-A-LONG The inspiration source for this mitts-a-long is a selection of knitting sheaths held in the Shetland Museum and Archives. These sheaths were used by knitters and often made by seamen. Tucked into a waistband, they were used before ‘makkin’ belts’ to secure a knitting needle—a ‘wire’—at the knitters’ side, enabling them to knit more speedily. Although sheaths for this purpose are found in other places, those from Shetland tend to have a core of bird feathers, which grip and hold the knitting needle. The tapes or cords binding the feathers together are secured using a variety of sailor’s knots. These objects embody the ways in which knitting and fishing are entwined in Shetland’s economic and cultural past and, in your hands, they can continue to be part of an active culture of making. 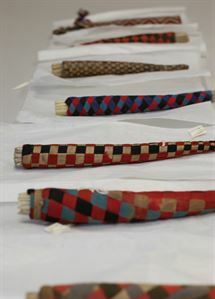 Enjoy discovering patterns, shading schemes and inspiration in their folds, knots and quills; thanks to the Shetland Museum and Archives for permission to feature the knitting sheaths here. This kit contains one balls each of Jamieson & Smith 2 ply Jumper Weight yarn in FC43, 77, 5, 9113, 1403, 93, FC47 and 142. INSPIRATION SOURCE FOR THE SHETLAND CROFT HOUSE MITTS-A-LONG The inspiration source is the Croft House Museum in Shetland. This mid-nineteenth century croft offers visitors a glimpse into what daily life was like for most Shetlanders in the 1870s. The peat fire, mantel clock and hap-stretcher tell of knitters labouring to produce knitted goods for sale, while a boat shed references the fishing that provided the main income on the croft. The rocks with which the walls are built speak to the geology of Shetland and the rich palette of locally available building materials; a special selection of yarns has been curated to help you explore these subtle tones. This kit contains one balls each of Jamieson & Smith 2 ply Jumper Weight yarn in FC61, FC62, 121, FC45, 202, 29, 77 and 81.